June 29, we celebrate the Feast of Saint Peter and Paul, foundations of the Church, and martyrs for the faith. Instrumental in the formation and propagation of the faith, both Peter and Paul worked tirelessly after the crucifixion to continue spreading the Good News of Christ. While the Scriptures do not record the deaths of Peter or Paul, from an early date it has been said that they were martyred in Rome at the command of Emperor Nero, and buried there. As a Roman citizen, Paul was beheaded with a sword, whereas Peter was sentenced to crucifixion. However, proclaiming that he was not “worthy” of the same death that Christ endured, Peter was crucified with his head pointed downward. Peter was born in Bethsaida on the Sea of Galilee. Like his younger brother Andrew, he was a professional fisherman and dwelt at Capernaum, where Jesus would stay, performing miracles, whenever he was preaching in that area. Following the miraculous catch of fish that Christ used to make them “fishers of men,” together with his brothers John and Andrew, Peter felt the call to become the first of Jesus' disciples. 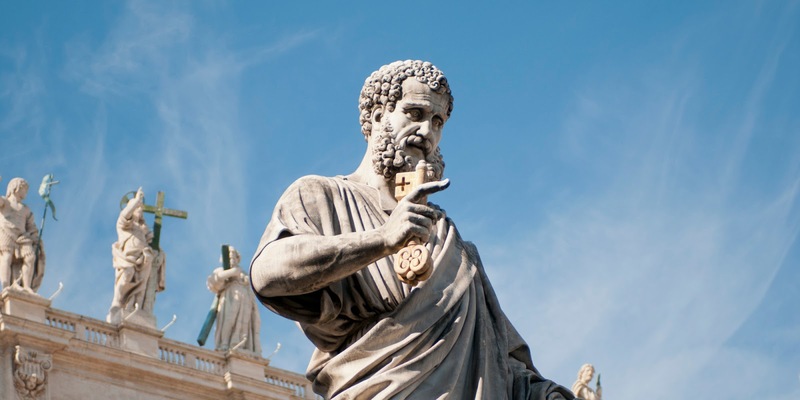 But much of Saint Peter’s life is lost to history. We know that he was present at the Council of Jerusalem (where he gave support to preaching to the Gentiles, leading to the universality of the Church), became the first bishop of Antioch, received and visited with saint Paul, and labored in Rome as an apostle. He is responsible for appointed the replacement of Judas Iscariot, and was the first to perform miracles in the name of the Lord. He further wrote two epistles, the first Papal Encyclicals of the Church. Saint Peter was imprisoned by King Herod Agrippa, and was miraculously freed by an angel. Rather than turn from his apostolic mission, he returned to Jerusalem, traveled teaching the Good News, and returned to Rome (where he labored for 25 years, building the Church of God). He was crucified by Emperor Nero on Vatican Hill, and his relics are now enshrined under the high alter of Saint Peter’s Basilica. From the earliest days of the Church, Peter was recognized as the Prince of the Apostles and the first Supreme Pontiff. His see, Rome, has thus enjoyed the position of primacy over the entire Catholic Church.